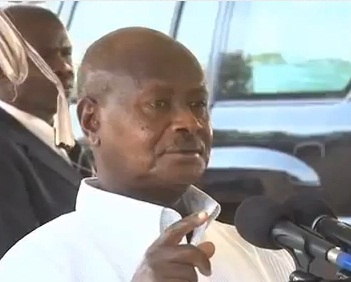 President Yoweri Museveni on Thursday, March 22, 2012 visited the family of the police officer who was killed during the clashes between A4C activists and the police. The President who was visibly disturbed went to Naguru Barracks to console the wife and her eight children. The President on top of consoling the widow told her that the force will take care of the education needs of the eight children and also promised to finish their incomplete house in Kumi. Reacting to the demonstrators, the President said that the laws might have to be changed for those who are offered bail more than once for the same crime. The Inspector General of Police assured the President that the officers who were seated before him were more than determined to serve. Meanwhile, Police is considering to charge the FDC Leader Dr.Kizza Besigye with murder of Assistant Inspector of Police John Bosco Ariong who was attached to Kafumbe Mukasa police post.